Remember when Steve Ganley was doing the hotline? Fourth of July would roll around and you'd be thinking about watermelon and fireworks and Steve would be exhorting you to get out and look for fall shorebirds. Huh? Many shorebirds, called waders in England, are long distance migrants, breeding the Arctic and wintering in the southern hemisphere. Arctic summers are short and adult shorebirds leave the breeding ground as soon as they have finished their business there. Sometimes in late June it's impossible to know whether an adult shorebirds is going or coming. By the time you read this, most adult shorebirds may have already passed through Arizona. The plovers, with their plump bodies, large eyes, and short, straight, rather bulbous bills are a typical of the shorebird group in some ways. Many of them are only short distance migrants and most of them can be found at certain times of the year in upland pastures, we meadows, and open fields rather than places we would consider shoreline. Killdeer do migrate form the northern limits of their range, but here in Arizona they are year round residents. More will be seen during migration and winter as numbers swell with transient and nonresident birds. This Killdeers was photographed at Painted Rock Dam July 25, 1993. Here's another plover with a single black breastband. It is boldly patterned with well-defined field marks. The breastband is complete but not particularly wid, but is sorting out the small plovers be aware that the breastband can appear either broad or narrow depending on the posture of an individual bird, so width itself is not a good field mark. The face is marked by two black bands separated by the white forehead. These bands meet in front of the eye and continue on behind it to form a well defined black auricular (ear) patch. There is an obvious white supercilium (eyebrow), and the short, stubby bill is obviously bi-colored. The overall tonal difference between upper and underparts appears about the same as our Killdeer in the first photograph. Since we're not sure this bird was photographed in Arizona, we cannot eliminate Piping and Wilson's Plovers simply be geographical range, so there would seem to be five possibilities, five plovers with a single dark breastband: Piping, Wilson's, Semipalmated, Snowy, and fledging Killdeer, Let's eliminate young Killdeer because our bird appears robust, yet short-legged, nothing like a spindly, long-legged young Killdeer with its uniformly dark bill. Wilson's Plovers also show a completely dark bill in all plumages. Additionally, through the contrast between upper and under in a Wilson's would be about the same as the quiz bird's, Wilson's typically pauses in its feeding in a quite recognizable upright posture, much more vertical and very unlike the horizontal posture of the bird in the photograph. This is not a Wilson's Plover. Snowy plovers, too, have uniformly dark bills in all plumages and, as their name implies, the contrast between upper and under is much greater in Snowies than our photograph shows. Snowy Plover upperparts are usually described at "light gray-brown." The clinching field marks for Snowy Plover, however, are the bands. Snowies' breast band is incomplete, often described as "breast patches". There is a forehead band and black auricular patch, but only in breeding plumage, and Snowies never show a band from cheek to cheek across the bill. This is not a Snowy Plover. Piping Plovers in breeding plumage will show a bill similar to our bird's, two-toned, bright orange at the base, black at the tip. Pipings also have a breastband, a headband, and a white eyebrow stripe like our quiz bird. However, in all plumages they lack the black auriculars and the cheekband, so their face appears much plainer. The upperparts of the Piping are the lightest of any of our candidates and are described at "dry sand." Pipings are ghostly little plovers, easy to over look. This is not a Piping Plover. Semipalmated Plovers is our most boldly marked and most common migrant plover. It is a long distance migrant which may pass through Arizona quite early in the "fall." There are Maricopa County records from the second week in July. Semipals breed in the Arctic and winter to southern South America. this didn't seem such a difficult identification, but if you caught the play on words in the clue, you know we're not quite finished. My apologies. I just couldn't help myself.. This is not a Semipalmated Plover. 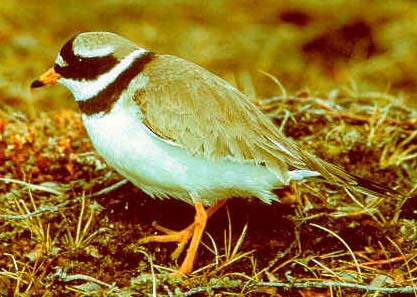 Charadrius Semipalmatus. Ever wonder exactly where that odd work "semipalmated" cam from? From Latin, literally "half hand." Look at the back of your hand. There's a little webbing between each finger. Look at the quiz bird's feet. There's no webbing between the toes. This Common Ringed Plover was photographed in June on Bylot Island in the Canadian Arctic. Father south we had seen a Semi. He had webs. The guidebooks say you can't see this character in the field. My slides prove otherwise. Our third plover looks like it is actually on a shore. Unfortunately it is smaller in the frame and quartered away from us so that we are not getting as clean a look at its diagnostic field marks as we did with our first two birds. We have enough, though. We can see the black headband, the black auriculars, and the black breastband which, if we look closely enough, we can tell is not complete. The bill and lets are uniformly colored and appear as black as the facial markings. There's not much contrast in body plumage. Certainly not as much as our first two birds show. The back color looks like wet sand. 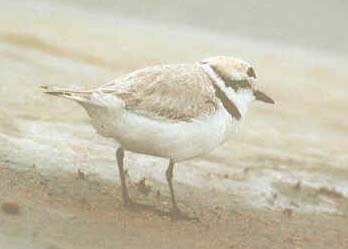 This Snowy Plover was photographed June, 1988 at Wilcox, Arizona ponds. Snowy Plover is listed as a summer transient and rare breeder in Arizona. There have been no confirmed nestings at Wilcox since the early '80s, but Snowies nested at Painted Rock Dam in Maricopa County after the floods of '93. Wilson's Plover winters as close as the Gulf of California and has been recorded at the Salton Sea. Piping Plover is a threatened and endangered species seen occasionally on the California coast. Common Ringed Plover is Arctic dream. Arctic dreams are good in Arizona's summer heat.